Why Convert A Gas Car To Electric ? The first thing I had to decide was whether my miles driven was with-in the current technology limits of the electric vehicle. Would I have problems on a regular basis with a limit of 50-75 miles? The answer was NO. My drive to work was 7 miles one way, my friends all live with-in 30 miles of my home, and my long trips were limited to 3-4 times per year. These long trips could easily be covered by a rental car and save me money in extra insurance costs and payments on a second car. The second thing I had to consider was what kind of car to convert. Did I need a practical vehicle like a four door Rabbit that could haul people and groceries with equal ease, a pick-up truck, or something fun that I would enjoy driving for a long time. I opted for something fun to drive and decided on the Porsche 914. 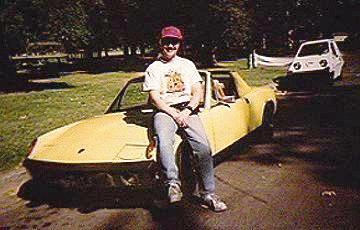 The Porsche 914 has been successfully converted by a few other people and I liked the looks of it. It is also a car that there are quite a few of, so finding upgrade parts for the car itself should not be a problem. The car I bought had a blown engine, so I got it for a reasonable price and the body was in very good shape with no dents or rust problems that could cause structural integrity concerns. This is an issue that is very important due to the added weight of the batteries. In a related direction came an important decision on how I wanted to use the car. Was I more concerned with speed or distance driving? This is important because it would determine how I would configure the vehicle and what kind of components and batteries I would use. Speed won. After all the 914 is a sports car and I wanted to be able to show off what an EV can do and prove that they are NOT golf carts. I wanted to have no trouble with keeping up with traffic on the freeway and the distances I travel around town would not be affected as 90% of my driving is less than 35 miles a day. I also wanted to use readily available, off-the-shelf components and batteries to show the public that EVs are here now and that THEY can own one. What did this mean? It meant that I would want to use 120volts or more for speed (I decided on 144volts) and that I would have to use something other than 6 volt batteries due to weight concerns. I could squeak by with 120volts and 6volt batteries, but the car would be at or over the designed gross vehicle weight, but at 144volts I could not do this. There is also a space constraint on where you can mount alot of batteries. After alot of consideration I decided to use a new 8 volt battery that Trojan had just come out with. This battery is a comprimise between the 6 volt and 12 volt batteries. I'm hoping it works for my purposes. The weight will be a little more than using 12 volt batteries and the range would be a little less that using 6 volt batteries. It will be a comprimise. To demonstrate the weight differences between 6volt and 12volt batteries in a 120volt system you would get numbers like the following - 20, 6volt batteries would weight around 1200lbs; 10, 12volt batteries would weigh around 600lbs. As a general rule the more lead you have on board the further you can travel, so the 600lb pack would travel less than the 1200lb pack in the same vehicle. Actual distances traveled between the two types of packs can vary as they relate to the whole car, not just to the weight of the battery pack. A lighter car will also go further than a heavy car (i.e. a Porche 914 with 10, 12volt batteries will travel the same distance, maybe more than, a Chevy Blazer with 20, 6volt batteries). Weight IS important. To get ahold of the EVs components that would help me get to my goal, I contacted a number of EV parts companies to get quotes and to talk to them about my ideas and to get their input. Decisions were made, parts ordered and money sent off. One thing that I did not do yet was to order the batteries as they are one of the last things to go in the car. You will need to know the size of the individual batteries to plan their layout in the car and to help with the other component layout design. Since I was going to convert this car myself (and I had absolutly no knowledge on the subject) I took a class from one of the EV parts suppliers (Electro Automotive) in conjunction with some great folks at Solar Energy International (SEI), on converting a gas car to electric so I would have some experience to draw on. I am also involved with my local chapter of the Electric Auto Association and can draw on it's members knowledge base. Sometime in the not to distant future I plan on putting down how I did my conversion and include some pictures of the car in it's various stages of construction. Please check back in about a month or so when I expect to update this section. This is an open area. Very open. I would like to get involved with racing and showing the car like many other EV drivers do. I also want to use it to educate the public and help promote the EV as a viable means of transportation. I'll let you know as time goes bye what's up.